The Auromar Farm ; Finca la Aurora is located between 1570 and 1770 MASL in the highlands of Candela, Chiriquí, Panama. The finca is comprised of 30.5 hectares. The total farmed area is 14.5 hectares in the lower 2/3 of the elevation. The rest remains preserved forest. In the farmed area the use of shade is much heavier than others in that region (1-4) offering a very nice swing from day head to night chill. Because of altitude and the microclimate from the forest, the harvest begins late in December and ends in mid-March. The beans take full benefit of the drop-in humidity between December and January at season´s change, and the sunny dry summer that runs through mid-April. The outcome such combination, forest, shade and late harvest is a limited-supply, highly complex coffee, very consistent every harvest. The Auromar Geishas: All the Auromar production is hand collected at the peak of ripeness. Harvesters are paid a premium and a bonus well above the industry standards so to carefully pick only the ripe cherries. After collection in the field, the beans are micro selected upon arrival at the mill, From here the Auromar Geisha is processed either as a regular Washed or processed as Natural. The production process of the Auromar Geisha is very traditional but at the same time very meticulous. After a careful selection the cherries upon arrival at the mill, they are washed and sun dried in the courtyards of the Café de Eleta mill. Once dry, the beans go through two rounds of manual selection. The coffee then rest for four weeks before first samples are tested and if ok shipped to potential buyers. No coffee is shipped unless it has at least six weeks of rest. Auromar planted its first seeds in 2006. 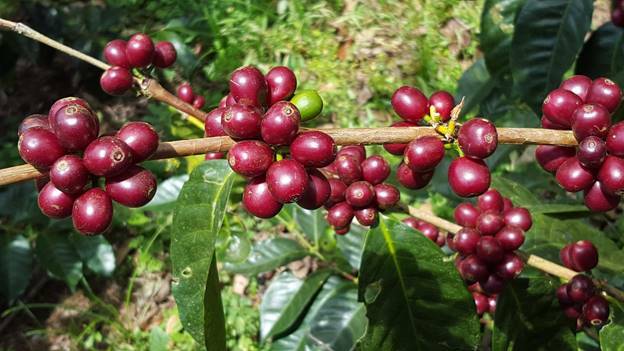 In 2013, the first year ever of commercial production, the Auromar Geisha Washed, better known as “Ironman” won first place in the Best of Panama (BOP) competition. In 2016 Auromar won the BOP again this time with the Auromar Natural CAMILINA. Between 2014 y 2017 the Auromar Geishas have been in the Top 30 coffees according to The Coffee Review. In 2015, Auromar Camilina scored 96 points, in 2016 , scored 94 points and in December 2017 the Auromar Geisha Natural achieved 96 points. According to The Coffee Review Camilina is beautifully structured and almost impossibly intricate in flavor and aroma. The fruit sensation is so deep and so complex that one could find almost any note in it: we settled on guava, mango and tangerine. Intensely floral – passion fruit, lilac, lily – with crisp cacao nib and sandalwood complication. Rich, lyric acidity; syrupy but buoyant mouthfeel. The aromatic fireworks quite a bit but still saturate the finish.